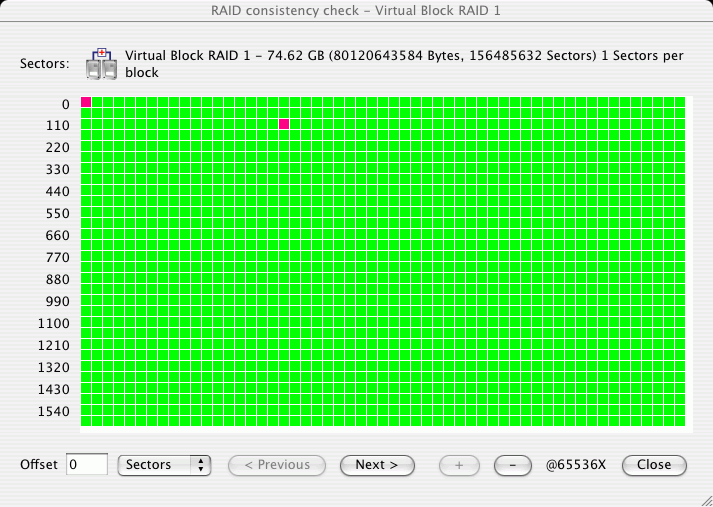 You may check RAID consistency (whether the data parity values are valid) for RAID layouts with parity blocks. > The RAID consistency check window will appear showing the progress. When the check is finished, you may inspect the results. Data parity values are valid. Data parity values are not valid. When a mouse pointer hovers over a block, a tooltip will show the sector range within the block and number of consistent and inconsistent sectors. Double-clicking the block moves it to the upper-leftmost corner and zooms in the data by 2.